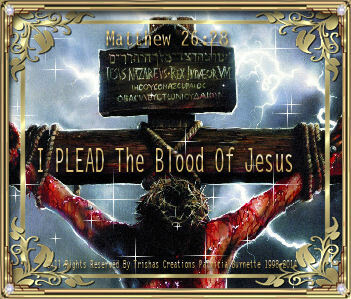 Welcome to "I PLEAD The Blood Of Jesus"
There is one thing I know for certain that the devil cannot stand for God's People to have something they can ward his evil off of our lives with and one of them are "PLEADING THE BLOOD OF JESUS CHRIST" over ourselves and our families and our circumstances. He hates the mention of Jesus' Name because he knows there is even Power in The Name Of Jesus! Let's look at a few things which will help you to see and understand the "TRUE POWER of The BLOOD!" Pleading the Blood of Jesus works so well in real life combat situations when it really is needed to defeat attacks that are coming against us from the dark side. Learning how to properly Plead the Blood of Jesus for any deliverance and protection that you may need is just one part of our arsenal. As you will see in the next section, you can also Plead the Blood of Jesus on specific things that you want protected before any kind of adversity could strike them – like your body, your house, your car, your finances, etc. The goal is to Plead the Blood of Jesus on those things in order to protect you before any kind of adversity could ever come your way. What God the Father had set up was the sacrifice of blemish free animals such as bulls, goats and lambs. Their blood had to be shed once per year on what was called the Day of Atonement. The shedding of these animals blood was what gave the Jewish people a temporary covering for their sins so as to enable them to enter into a covenant personal relationship with God the Father. Now watch this. In the shedding of the lamb’s blood on the Day of Atonement, there was a temporary covering for the sins of the Jewish people. Then Jesus comes in the New Testament, and the shedding of His blood now gives all believers complete and total forgiveness for all of their sins. If the shed blood of the Old Testament lambs used for the temporary covering of sins eventually leads to the shedding of Jesus’ blood for permanent and total forgiveness of all of our sins – can we also use that same analogy and say that the shed blood of the lambs used in the Passover for divine protection could also lead to the shed Blood of Jesus having divine protection in it? Taken from “The Blood of Jesus for Deliverance and Protection”.